Did you watch the first Republican debate? I did. It's frustrating with so many people and so little time. 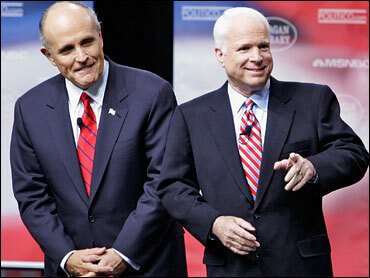 If you are not paying close attention, you miss the good stuff, like Rudy Giuliani trying to straddle the abortion issue or John McCain's emotional defense of the military surge in Iraq. Watching these debates with so many candidates on stage is like being served a massive platter of hors d'oeuvres. We get a taste, but not enough to satisfy. The real star of last night's debate was Ronald Reagan. The candidates did everything they could to invoke his spirit there at his library in California, with his old Air Force One hanging above them. It was surreal, to say the least. With Nancy in the front row, each candidate paid homage to the Gipper. It's Reagan they want to emulate, they said. Once upon a time, the current resident of the White House was viewed as Reagan reincarnated. Watching the debate last night, I got the sense the Republicans are still waiting for the second coming.